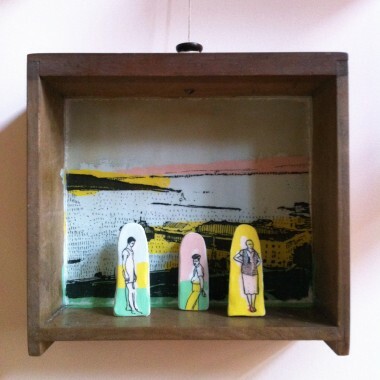 A Moment of Silence, 2013, mixed media, 8" x 7" x 3"
Choices, 2013, mixed media, 6" x 6" x 2"
Yard Sailirs No. 1, 2013, mixed media, 7" x 8" x 2"
Just Playin', 2013, mixed media, 3" x 7" x 3"
Mt. Rushmore, 2014, mixed media, 3" x 6" x 3"
Into The Woods, 2013, mixed media, 6" x 7" x 3"
Under the Trees, 2013, mixed media, 10" x 10" x 3"
The Explorers, 2104, mixed media, 5" x 8" x 5"
Foley Gallery and Accola Griefen Gallery are pleased to present Small Items Enclosed, a solo exhibition of work by Lauren Simkin Berke. The exhibition will be on view at Foley Gallery from April 2 through 27th with an opening on Saturday, April 5th from 6pm to 8pm. Foley Gallery is located at 97 Allen Street in New York City. Since the invention of the camera people have used photography to document their lives, developing tangible myths of their existence for future generations. Yet today family photographs are no longer the prized possessions they once were. Berkes work is concerned with the collecting, archiving, dissecting and drawing of people and places from discarded documents. 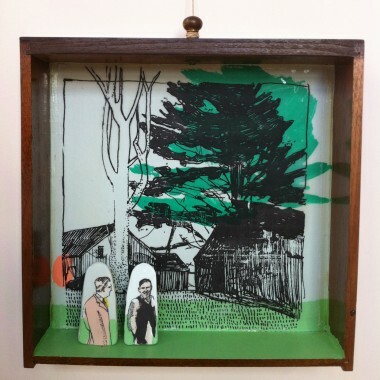 Berke has been drawing, in ink on paper, from found photographs for almost a decade, and has used these ink drawings to generate works with paint, print and mixed media. 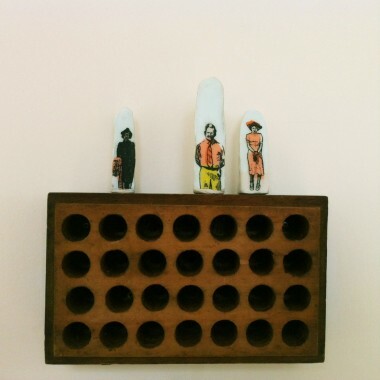 Small Items Enclosed is made up of several large paintings and over 100 small figures in three-dimensional environments. 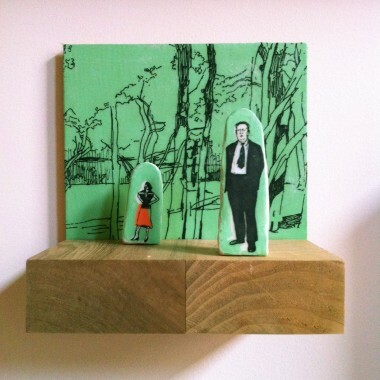 The paintings and miniature sculptural worlds starts with the artists drawings, which are likewise based on found photographs. Sources include Victorian studio portraits, 20th century snapshots, high school yearbook headshots and vacation photos. 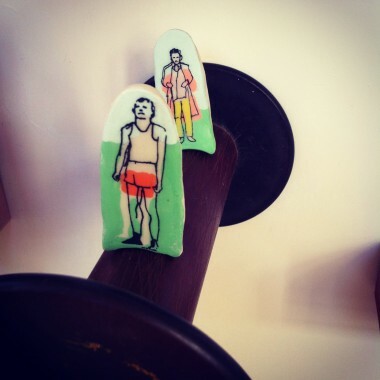 Removed from their original photographic settings, these tiny drawn characters occupy a variety of tableaux that were created through a process of drawing, painting and assembling of found objects. 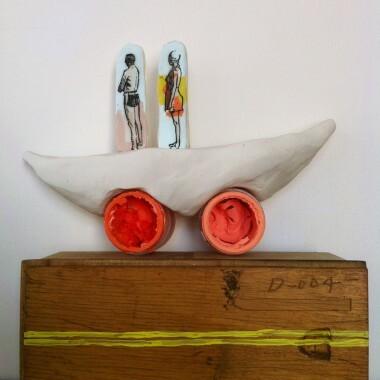 Shoes horns become mountains, desk drawers are green vistas and wooden boxes transformed into boats. These works may bring to mind whimsy but they also speak to place and past. Lauren Simkin Berke received a BA in anthropology from Cornell University and an MFA from the School of the Visual Arts, NYC. The artist has exhibited in solo and group exhibitions throughout the Unites States and abroad at venues including P.P.O.W, NY; Gescheidle Gallery, Chicago; A.I.R. Gallery, NY; The Museum of Arts & Crafts ITAMI, Japan; Rugby Art Gallery and Museum, UK; and Paul Robison Gallery at Rutgers University, NJ among others. 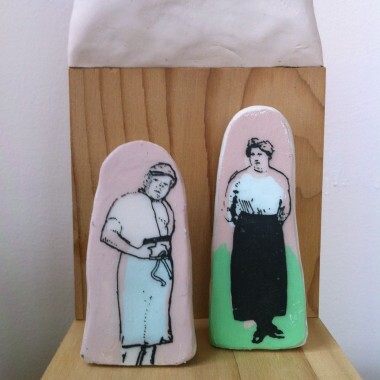 Berke was selected for the Elsewhere Collaborative Residency in 2008, and the A.I.R. Gallery Fellowship in 2007. Berkes clients include The New York Times , The Boston Globe , Simon & Schuster, American Express and many others. Berke is represented by Riley Illustration and Accola Griefen Gallery. 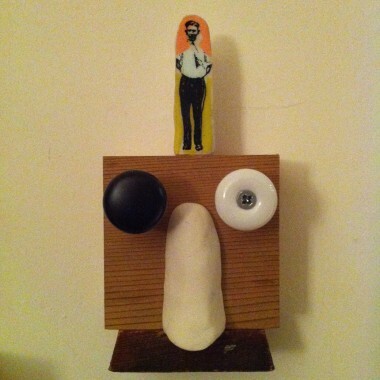 Berke lives and works in Brooklyn, New York.